Typhoid vaccine is a suspension of killed Salmonella typhi, containing not less’than, 1,000 million bacteria of S. Typhi Ty-2 strain and 500 million each of Salmonella typhi A & B strains per human dose of 1 mi. Preserved by 0 .5%Phenol. 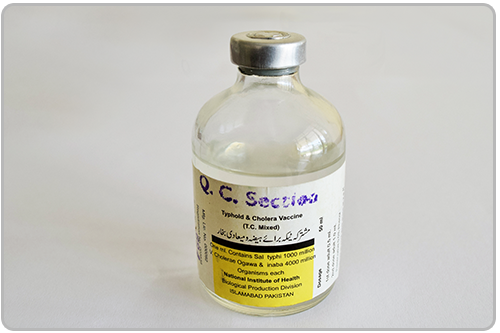 The strain used has the full complement of o H. and VI antigens The organisms are killed by heating at 56°C for one hour and by addition of Phenol 1%. For protection of persons in direct contact with patients and carriers. For persons exposed by reason of their occupation (medical and Paramedical persons etc..). In Institutions where the appropriate hygenic condition can not be met. In areas of high endemic incidence. For persons travelling to endemic areas. In case of Impending danger of epidemic and in emergencies such as flood or earthquake etc.